Single-Ply roofing is a flat, polymer based material that provides a single waterproof layer. The sections are sealed at joints with an adhesive, heat or by mechanical means. One of the main reasons they are so popular is due to the fact they are lightweight and flexible, plus very cost-effective. This makes them a great choice for new construction and single-ply replacement projects. EPDM – EPDM, or rubber roofs as they are more commonly known, are an elastic roofing membrane. They are cost-effective and can be treated with a roof coating for a longer life. PVC – PVC roofing membranes are the most popular choice for commercial flat roofs. There are many color options to suit any style of building. TPO – Introduced around the 1980s, this is considered the more environmentally friendly option. This membrane can be partially recycled into other products as well. At one point in time its sensitivity to harmful UV rays was a common issue, but recent improved formulas have corrected that weakness. 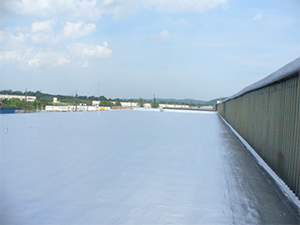 TPE – This roofing membrane was developed to build upon some of the TPO membrane features. This roofing system is 100% recyclable and one of the simplest roofing systems to replace and install. Another major benefit is that small punctures can be repaired by simply reheating that section. PIB – PIB, or polyisobutylene, is the oldest single-ply membrane. With proper maintenance and professional repairs, some PIB roofing units are lasting well over 50 years. This roofing system is 100% recyclable too for an added bonus. This membrane has also been confirmed to have no significant impact on our environment. At Capital Coating, Inc., we understand that a roof replacement can be a stressful time for building owners. With our clear project goals and open lines of communication, there is no need to worry. 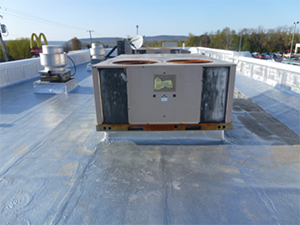 Every commercial roof replacement project begins and ends with a thorough roof inspection. This allows our team to devise a clear replacement plan. It also allows us to ensure your complete satisfaction once the work is completed. While our team is replacing your roof, work will be provided in a timely manner to limit the impact it has on your day-to-day business activities. With all of your commercial roofing contractor options in the Northeast, we thank you for trusting us with your single-ply roof replacement. 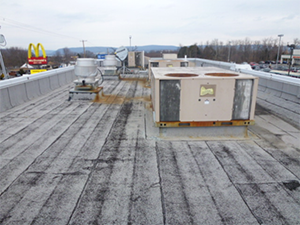 If you are interested in a commercial roof evaluation call us today at (717) 442-0979. We look forward to hearing from you.